You are four-handed in a tournament and are basically tied for second place with 2,605,000 in chips (65 big blinds). There is one short stack remaining with 845,000 in chips (21 big blinds). The short stack raises to 80,000 and it folds to you in the small blind. You look down at 8 6 and decide to three-bet to 210,000. Your opponent calls and the flop comes down A J 3 , giving you a flush draw. You continuation bet 175,000 and your opponent moves all in for 630,000. The pot currently has 675,000 in it plus the additional 455,000 to call. If you call and win, you’ll be in a dead heat with the chip leader. If you call and lose, you’ll be nearly tied for the short stack, but will still have 43 big blinds. The payouts for the four remaining prizes are as follows: 4th — $46,579, 3rd — $62,733, 2nd — $85,852 and 1st — $138,938. Do you call or fold? What kind of price do you need to be getting on your flush draw in order for a call to be profitable and what kind of price are you currently getting? How does ICM (Independent Chip Model) play into your decision? If calling, do you regret your continuation bet size on the flop? Would shoving have been a better play to maximize fold equity? After thinking it over for a few moments, Kevin Eyster reluctantly called with his flush draw on a board of A J 3 and his opponent, Jerry Johnson, turned over A 5 for top pair. The turn and river came 2 9 and Eyster took the pot. 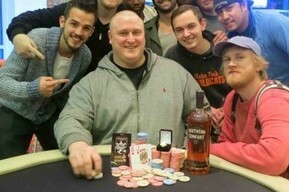 Johnson was eliminated from the WSOP Circuit main event at The Lodge Casino in Blackhawk, Colorado in fourth place, earning $46,579. Eyster went on to finish runner-up, earning $85,852. The winner was Jonathan Taylor, who picked up $138,938 and his third WSOP Circuit ring. I would have done the same thing, pretty much. Pre-flop I would have folded the hand to begin with. If I had called and seen the flop and he had shoved I would have folded. I have 3 reasons as to why I would have folded. Number one is that I would have been out of position to a short stack; why risk the chips if you don't need them that badly?.The second reason being he was a short stacked player who just flat called a 3-bet, while he does have position and may have suspected that your were trying to pull a squeeze play typically this would indicate a fairly if not very powerful hand. The third reason being that I myself am a fairly tight tourney player, while I realize that the blinds are getting high and you can't wait for a big hand, being under the gun with a medicore hand is always dangerous and can lead to a lot of trouble. The key to this hand is that you're down to 4 players. earlier in the tournament the is a preflop fold. But at this point i would have played it the same way. I have practiced some basics in poker by playing in alot of tournies.Anytime I get 4 cards to a flush,I go all the way,unless there is a full house showing(or better),or close in the making. Since there is not a full house in the making on the board,its a go for the flush draw. I would have played it the same way. The short stack only called the three-bet which to me would indicate to me A-x or maybe suited connectors (less likely). At this point of the tournament, calling the all-in is appropriate. If this happened at the beginning of the tournament, though, I would have folded. The pot odds are actually closer to around 3 to 1. There's 675k in the pot already and then add the opponent's 630k. So it's roughly 1300k to 450k which is 2.89:1. "The pot currently has 675,000 in it plus the additional 455,000 to call." Add up all the bets. Both players are in for 210 before the flop (420), the big blind adds 40 (460), and then 20 worth of antes (480). 175 Flop bet (655). Then opponent's 630 (1285). I will not re-raised during preflop when you are out of position with a hand that does not do well in heads up situations. If, I want to play that hand I will flat. And check raised all-in on the flop. Put the tough decision back to the short-stack. You certainly can't fold. That effectively doubles the short stack anyway, and it's possible Villain is jamming hoping Hero has the fold equity. I'd call. Not sure if Villain would min-raise UTG w/ KQ of diamonds or KJ of diamonds, or would call a 3-bet with them. Definitely not shoving. I would have played it similar - but would have shoved on the flop - not c-bet. Short stack may have put you on a bigger ace and folded - and even if you lose the hand - 43 blinds gives you ammunition to play more than just all-in poker. I think it's a clear call getting approximately 3:1 on what's essentially a 2:1 draw. Losing puts you approximately tied for last chip position, but that's still about half of the chip leader's stack, so you would still have a decent chance to win. This is a great spot to gamble and try to knock out another player as well as pad your stack. I think the 3-bet before the flop with this hand is fine occasionally, but definitely should not be the standard play as it's terrible to consistently play a speculative hand out of position in a heads up pot with reduced implied odds (plus the big blind will sometimes have a hand and come back over the top). I think the continuation bet is a little weak here (it's lower than the pre-flop betting), and probably should have been closer to around 250k or possibly all-in. After building up the pot pre-flop and hitting a good draw you should fight for it. A larger bet tells the opponent that you're prepared to play for his stack and gives you some fold equity. The small flop bet is just asking for the opponent to move in (possibly as a "bluff" in which your opponent at least has you high-carded), which you'd rather avoid. In this hand, I actually think the worst play was the opponent calling the 3-bet before the flop. Being on a short stack, he should have either moved in or folded here. Calling off a quarter of your stack trying to catch an ace that may not even be live is a bad idea. Your math is way off...The pot has 675 000 in it and you need to call 455 000 so where on earth are you getting 3 to 1?? ?You're getting around 1.5 to 1 here.The pot needs to have 1,35 million for you to be getting 3 to 1.And when you're getting 1.5 to 1 on a hand that's a 2 to 1 dog it's a mathematical fold. 675k in the pot after the flop bet and then the opponent's 630k. That's 1305k in the pot and 450k to go. Approximately 3:1. That 675k does NOT include the opponent's all-in! Add up the action before you make smug comments that are wrong. By making a continuation bet after the flop you are basically making the statement that you are going to call a shove by the small stack. If the small stack catches any part of that flop especially the Ace they are going to shove reguardless of a bet after the flop or not. The mathematics of the of the flush draw aren't there but looking at the payout difference for 2nd and 4th place it's where the 'gambling' factor of the game must be applied. Lose the hand or fold you're looking at around $50,000 for the tournament, but go all in looking for that diamond and there is now a very good chance you make a serious run at winning. At some point of every tournament you are going to have to get a little lucky to win. Wether it be AK vs QQ or some sort of similar situation, there is always going to be a make or break scenario. I call the all in and see the turn and river every time in this scenario. Terrible play from the Hero. What plan did he/she have? (1) First incorrect option was the 3 Bet OOP vs a short stacker increasing your variance when you didn't need to. A flat call or a fold would have been better. (2) What is you plan to deal with a 4 bet shove pre-flop? Are you planning to call it with the 86s? (3) Ok so you did 3 Bet and get a flush draw on the flop you need to shove and apply some folding equity pressure. To balance this you need to do the same with any Ace hand in the same position. Anytime you are facing a short stack that has raised, you are committed to their inevitable all in. Especially if an ace appears on the flop. Would have checked the flop.Flush draw in this scenario is good enoegh to call whatever short stack decides to do, having decided upon entering the hand pre-flop that I would be playing for all of short stacks chips. Without the flush draw would have folded. tl;dr: Calling the flop shove is fine because Hero is priced in, but he could have avoided being priced in, and thus decreased his variance, by taking any number of different actions before that call-the-shove decision. First off, 3-betting out of position against a short-stacker with a pure drawing hand is a mistake, even at the end stages of a tournament. If Hero wanted to take a gamble on a flush or straight draw, he should have just flat called from the SB. No shame in doing that with a medium drawing hand out of position. Let's consider the Villain's range here. He's UTG 4-handed, which put another way, means he's in the cutoff, one off the button. Not having info here about his tendencies, a perfectly normal cutoff opening range is somewhere around 30 to 40 percent of hands (pairs, Broadway, Aces, maybe some Kings or suited connectors/one-gaps). Being out of position, you'd want to 3B bluff for value with something well ahead of his range. 86s is not well ahead of the range, so this must be a 3B bluff, which needs to succeed about 70 percent of the time to autoprofit, unless you have reason to believe you can take it away on a later street. Hero can't really have hope that 86s will be good as a value hand. If Hero was going to 3B bluff here, he'd be much better off doing it with an Ace or King in his hand, where he could benefit from card removal effects if called. We don't know how often Hero has been 3betting from the SB, but if it's frequently enough to raise Villain's suspicions, then that, coupled with the fact that a short stacker raised in position at the end stages of a tournament, should be enough to assume that he won't get anywhere near 70% folds in this spot. So he should never have 3B to begin with. Once his 3B and was called, Hero probably should have considered that a failed potshot bluff, giving up and saving himself some money. The Villain's flat call of a 3B, assuming it's not a trap, looks weak and possibly cuts off the top end of his range, the big pairs, AK, AQ, maybe some more if he's a liberal 4-bettor. But it also kicks out the worst cards at the bottom end of his range. So maybe he continues with somewhere around a third of his raising range, something like 99-55,AJo-A5o,AJs-A2s,QJs,JTs,T9s. That's a pretty Ace heavy range. When the flop hits, Hero has about 36% equity against that range (so says Flopzilla). 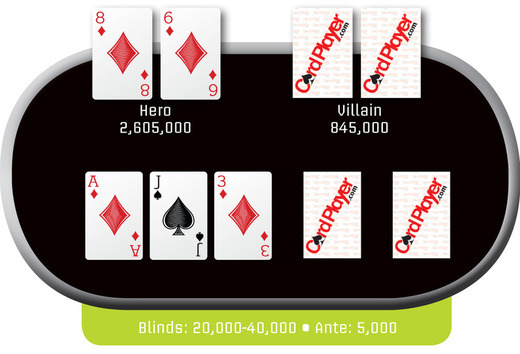 Meanwhile, with an Ace on the flop, Villain's range makes top pair or better 71% of the time. Further, since Villain has an Ace, the card removal effects are working for him and against Hero. So we could expect, assuming (perhaps incorrectly) that Villain folds anything below top pair, at most a 29 percent fold to C-Bet ratio here vs. a normal c-bet size. That's not a lot of fold-equity for a semi-bluff. A shove from the Hero on the flop, however, might have bumped that fold equity a little higher, and Villain may well have folded his weak Ace. Like the poker maxim says, you need a better hand to call than to shove. Hero is crazy if he thinks he was trapping here with a weak flush draw and an Ace on the board. Once Villain shoves, we can narrow his range further to top pair or better, flush draws, a few flush draw/pair combos and maybe a few naked bluff combos (Villain doesn't really need to balance his range with naked bluff combos; the low Aces are the bluff end of this range). Against this range, Hero has about 35% equity (not much change). Hero also has a reverse implied odds problem if Villain has a nut flush draw or two pair: Hero might hit his diamond and still lose. The pot is laying hero about 25% and his equity is about 35%, so he has to call here, but he's basically been made pot stuck and just increased his variance big time in a spot late in a tournament where he probably won't find himself often enough to overcome the swings. Admittedly, I don't know enough about ICM to analyze that aspect, but there is a pretty huge jump from second to first and a huge drop for 3rd and 4th place. Giving himself the opportunity to win it all by taking a big risk to be near the chip lead might well have been worth it. But the weak way he played the hand unnecessarily increased that risk. Hero is getting 3 to 1 and wins this hand 30-35% of the time against Villian's assumed range so it is definitely a call according to pot odds. The ICM indicates that calling the all in is profitable over folding to the all in with an EV of $2,197. All players are guaranteed $46,579 so remaining payouts are 4th: 0 3rd: $16,154 (0.11%) 2nd: $39,273(0.265%) 1st: $92,359 (0.625%). Remaining prize pool is 147,786. The information in the article makes it sound like the following chip counts are correct, but they can't be because they total 9,505,000 and there were 8,420,000 chips in play. 1st: 3,450,000 (0.3347 ICM Equity) 2nd (Hero): 2,605,000 (0.2791 ICM Equity) 2nd: 2,605,00 (0.2791 ICM Equity) 4th (Villain) : 845,000 (0.1071 ICM Equity). The 2nd place and 4th place chip counts are correct according to WSOP.com but 1st and 3rd are not listed. I changed the chip counts to 1st: 2,800,000 (0.3151 ICM Equity) 2nd (Hero): 2,605,000 (0.3007 ICM Equity) 3rd: 2,170,000 (0.2655 ICM Equity) 4th (Villain): 845,000 (0.1187 ICM Equity). Hero's EV before the start of the hand is (0.3007 * 147,786) $44,439 which is $5,000 more than the remaining 2nd place payout. This is in addition to the $46,579 that he is already guaranteed. Total EV is $91,018. Villain's EV before the start of the hand is (0.1187 * 147,786) $17,542 which is $1,400 more than the remaining 3rd place payout. If Hero calls the all in bet and wins, he will win 845,000 (4th place player's chips) + 40,000 (Big Blind) + 10,000 (antes from 1st place player and 3rd place player) for a total profit of 895,000. His EV will increase to (0.3979 * 99,324) $39,521 in addition to the $62,733 that he is already guaranteed. His total EV will have increased from $91,018 before the start of the hand to $102,254. The new chip counts will be 1st (Hero): 3,500,00 (0.3979 ICM Equity) 2nd: 2,800,000 (0.3343 ICM Equity) 3rd: 2,170,000 (0.2679 ICM Equity). The remaining payouts will be 1st: $76,205 (0.77%) 2nd: $23,119 (0.23%) 3rd:0. All 3 players will have guaranteed $62,733. Remaining prize pool will be $99,324. If Hero calls the all in bet and loses, he will lose 840,000 (Villain's chips) + 5,000 (Hero ante) and the new chip counts will be 1st: 2,800,000 (0.3077 ICM Equity) 2nd: 2,170,000 (0.2571) ICM Equity) 3rd (Hero): 1,760,000 (0.2186 ICM Equity) 4th (Villain): 1,740,000 (0.2186 ICM Equity). Hero's EV will now be (0.2186 * 147,786) $32,306 in addition to the $46,579 that is already guaranteed. His total EV will have decreased from $91,018 before the start of the hand to $78,885. If Hero folds to the all in bet, he will lose (Ante 5,000 + 3 Bet 210,000 + C-Bet 175,000) 390,000 chips. The new chip counts will be 1st: 2,800,000 (0.3094 ICM Equity) 2nd (Hero): 2,215,000 (0.2629) ICM Equity) 3rd: 2,170,000 (0.2590 ICM Equity) 4th (Villain): 1,285,000 (0.1688 ICM Equity). Hero's EV is now (0.2629 * 147,786) $38,852 in addition to his already guaranteed $46,579 for a total EV of $85,431. Hero calls and wins 33% of the time (ICM 0.3979) and calls and loses 67% of the time (ICM 0.2186). The average ICM of Hero's call is (0.33 * 0.3979) + (0.67 * 0.2186) 0.2777. Hero's ICM is 0.0148 higher when he calls. That is an EV difference of (0.0148 * 147,786) $2,197. If I was playing the hand I think I probably would have 3 bet to around 210,000 like Kevin Eyster did. I think I would have c-bet somewhere in the 225,000 to 275,000 range, giving myself a tank free decision to call if Villain shoves. If I just call pre flop, I'm either setting the big blind up for a squeeze play or I'm about to see a 3 handed flop out of position with no information on the strength of anyone's hand. I'd much rather 3 bet, get the big blind to fold and play heads up with the original raiser or take the pot down right there. If the original raiser shoves all in I'll obviously fold. I definitely wouldn't have folded pre flop even though the ICM suggests folding pre flop is the best play. Calling is okay but it's weak. When Villain raises to 80,000 the pot size is 160,000 and it's 60,000 for Hero to call. The odds are 2.67 to 1. Those are good enough odds to call and see a flop with 86s but I think putting some pressure on the short stack is always a good idea. I'm sure Eyster was planning on c-betting the majority of flops. I think shoving the flop is unnecessary but it's not terrible. If I was Villain I would have either folded to the pre flop 3bet or shoved all in. There is no reason to commit 25% of my stack pre flop with A5. Hero is going to c-bet the flop 9 times out of 10 and Villain will probably miss the flop 2/3 of the time. This one is actually quite straight forward. Your first play is to fold your 8 high out of position (or in any position for that matter). The short stack is the most likely player to be raising with a good hand, and almost 100% of his range is better than your 8 high, with some of those hands absolutely crushing you. If you're one of those brawn over brain types and decide to play the hand anyway, calling is better than raising because it saves you from putting another bet in as an underdog, gives you more room to give your opponent bad odds to call bluffs post-flop, and also allows you to get away from calling off the rest of your chips as both an underdog and not getting the odds you need to chase (what ended up happening). If you decide to raise, and you get called, red flags should be going off in your head. The small stack has now invested a substantial amount of chips into the pot relative to their stack: they have a hand. However, if once again you're the table tough-guy and now put in that c-bet, and your opponent shove-raises, you must know your opponent has a pair higher than your 8 making your flush draw still have only 37.1% equity, and you're being asked to put in 40.3% of the pot, another losing bet. Save your chips here again and wait for a better spot! Save those chips every step of the way for a situation where you can get your chips in as a substantial favorite, or at least a favorite at all! There are much better spots to pick than playing back out of position against a short stack who has shown nothing but strength. Be a cowardly bully, don't run head first into a better and then made hand. You got lucky to flop a flush draw but your hand actually lost equity. Sure you can always go uphill to win, but it's better to let it go when you know you're beat and getting it in good is a much more effective way to win.